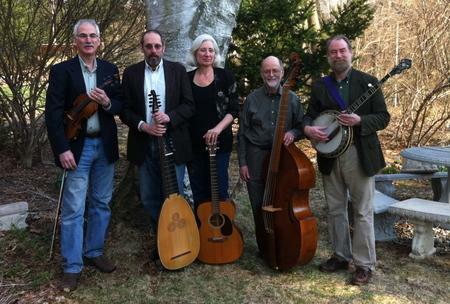 Foggy Mountain Consort (Lauck Benson, Peter Lehman, Anne Goodwin, Art Schatz, Doug Freundlich), with local father-son duo Chris and Quinn Eastburn opening. Doors, including the elevator entrance on Lombard Rd. off Pleasant St., open at 7:15. Concert benefits the Arlington Food Pantry. Please bring unexpired nonperishables for the Arlington Food Pantry as well. Even your kids will love this concert. Tickets at door (USD 15/USD 18) or in advance (USD 12/USD 15) at https://foggymountain.bpt.me, where more information about the musicians can also be found. St. John’s is located at 74 Pleasant St. (Rte 60) in Arlington. For questions, please email stjohns02476@gmail.com or call the church office at 781-648-4819. St. John’s Coffeehouse is a member of the Arlington Cultural District.